We produce the content you need to keep your patients and prospects engaged. Every month, you'll get an engaging newsletter that is 100% ready to go but can also be customized by you prior to sending. Each newsletter is personalized to your patients by name. On an average of twice per week, we will post content to your Facebook page that is either inspirational or educational (and links back to your website for more information). Know what all successful physicaltherapists need today? How to use email marketing to build strong relationships and get prospects to know, like and trust you! 8 ways to get clients to join your list and give you permission to email them regularly! 10 ways to increase the effectiveness of any email marketing campaign! How to get maximum benefit from popular social media platforms like Facebook, Twitter, LinkedIn, Instragram and Pinterest! The two biggest advantages of social media marketing and how to ensure you enjoy both! 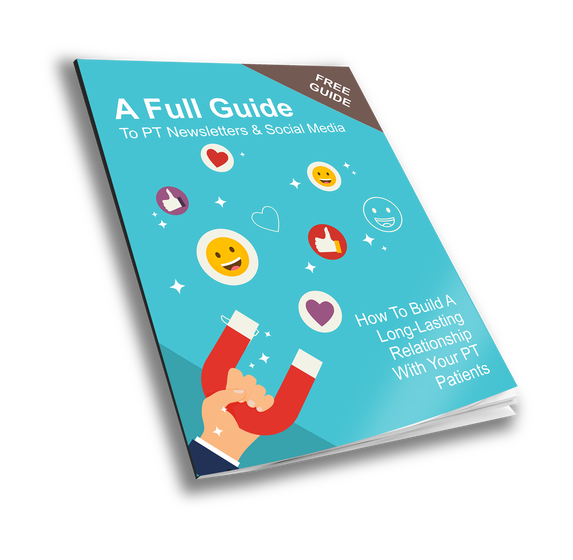 As consumers spend a significant amount of their time on social media it's important that your clinic produces the content to reach customers where they are at. Todays clinic owners are now in a position to reach and influence new patients for months with friendly, persuasive educational material that will help establish you as a highly-qualified, highly-effective physical therapist. And when it comes to health, people want to deal with experts. While they may hire an inexpensive contractor to mow their lawn, few people want the lowest-priced health professional. They want the best they can get – an expert who knows their situation and can help them feel better. Digital media like newsletters and social media are the perfect platform to demonstrate your expertise. With consistent, crafted messages you will become THE authority in your field, in your area or town. And don't make the mistake of thinking social media and email marketing apply only to at-home computer users. Smartphones and tablets have quickly changed the way people are using social media. All you have to do to realize that this is true is to take a look around – everybody has their phone with them! That's right, in the "old days" nobody left their house without their keys and wallet/purse, but now there's one more thing they must have – their phone. Today, people take their phone with them wherever they go, and more often than not, it's not just any phone but a smart phone that they can use to check social media and read email. In fact, according to Nielsen Research, "US adults spend an average of 34 hours per month using the mobile internet on smartphones. By comparison, they spend 27 hours on the PC internet." That means if you really want to find new clients and build stronger relationships with current clients so that they return to you again and again … you need to tap into the smartphone/tablet revolution. Simply put – if you want to build your business and grow your sales … if you want to attract new customers as well as retain existing customers … you need to go "where the people are" and today that means you need to be utilizing social media and newsletters. Provide delivery information, such as bounce rates, open rates, etc. So are you ready to add social media and newsletters to your marketing efforts? The first step is to download our free ebook. Our Newsletters and Social Media Guide reveals what you really need to know to succeed with these marketing techniques. To receive our free ebook, simply click here and complete the form on the right.